...now the customer is ready to buy the car! 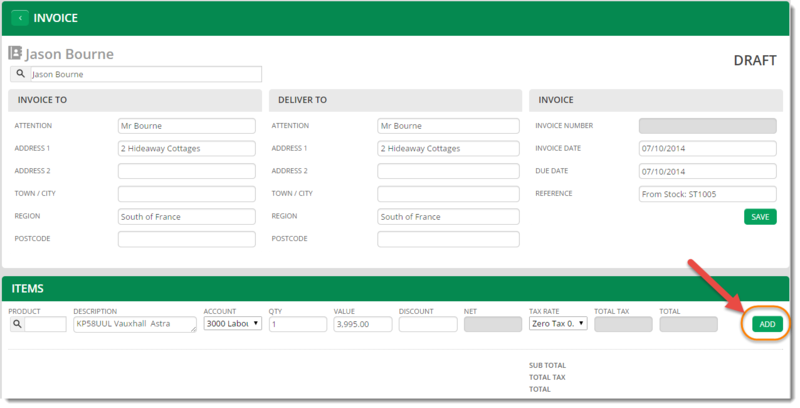 The contact details will be automatically pulled through from the Contact record you have set up in CarVue, and the invoice details will also be pulled through from the stock record to save you time. Just confirm the invoice value (how much you're selling the car for) and the tax rate, then click add to put the line onto the invoice. Once you have converted the draft to an invoice, simply click on the stock record link in the item line to be taken back to your stock record. And that's it! You've sold your car quickly and easily in CarVue.